Do you like Bat Dâmbâng? The Tonle Sap is one of the freshwater lakes of Southeast Asia. It is the largest wet land more in the entire world. The lake has many types of fish and a single BIODIVERSITY. The lake dates from 5100-5600 years ago. In the Cambodian diet, fish provides more than 75% of the protein. There is a floating city where they live off water and their crops, and the stilt houses are on the lake shore. The level of the water can differ by several meters between dry season and the rainy season, depending. 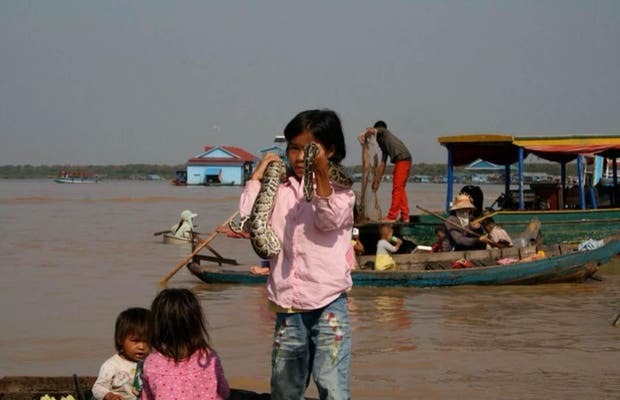 Upon arrival to Cambodia, a guide led us to the Tonle Sap lake, where we saw mangroves, crocodiles, and the floating villages of Vietnamese immigrants who are in the river that have come from the Mekong Delta. My recommendation would be to have a rest and then go visit the temples of Angkor.